The only known drawing of Shaka. Shaka (sometimes spelled Tshaka, Tchaka or Chaka; ca. 1787 – ca. 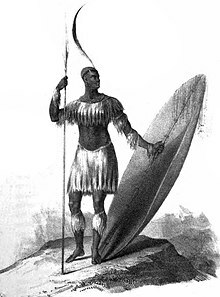 22 September 1828) was the most important leader of the Zulu Empire. He joined the Zulu tribal groups together into the beginnings of a nation. This Zulu nation ruled over a large area of southern Africa, between the Phongolo and Mzimkhulu rivers. His leadership and his energy make him one of the greatest Zulu chieftains. He has been called a military genius for his changes and new ideas. However, there were also brutal and cruel things that happened when he was in charge. Shaka maintained a good relationship with the Europeans in Africa, including the Colonial leaders. He was disliked by other Africans, including his own people, who hated his constant wars. Ten years of warfare placed incredible strains on the Zulu nation. Shaka, unstable and worried about being replaced by an heir, finally snapped into madness after the death of his mother in 1828. He imposed a year of celibacy on his people. He killed anyone who did not show enough sadness at the death of his mother. He was killed within the year by his half-brother, Dingane, who succeeded him as ruler. Even though he created brutal conditions for his subjects, he created the powerful Zulu Kingdom. This page was last changed on 9 March 2015, at 16:40.